Established in 1979, we have been expanding our business operations around the world as a leading professional manufacturer of hex key (allen key) wrenches in Taiwan. Satisfying your needs with strict quality standard, best service and innovative design are Jaco's missions. In our research and development effort, we are committed to our customers' requirements all the time. We will greatly appreciate your advice and any opinions. We thank you for your business and cooperation, and look forward to building our mutual growth together now and in the near future. Why do you buy products from Jaco? Because of "made in Taiwan"? Jaco will revolutionize the way you think about the products made in Taiwan. We are the only manufacturer in Taiwan whose each product meets the international standards. Jaco combines high quality with competitive cost. Try Jaco and you will get a better value for a less price. 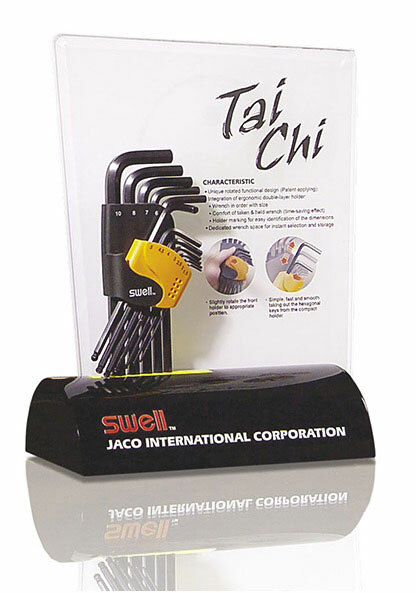 Jaco is an expert in manufacturing hex keys for more than 30 years and is knowledgeable in this field. Engagement in the strive for excellent long term commitment is our goal. Jaco has well experienced employees and strict Q.C. system to provide you with guaranteed quality, and also helps you pursue higher standards. Jaco provides you with different packaging combination choices for customers' market. Jaco will continuously develop new packaging combination to fulfill clients' purchase desire. Let Jaco help you become a more successful business. Established "Swell-Link Industry Co. Ltd." and produced hexagon key wrenches. 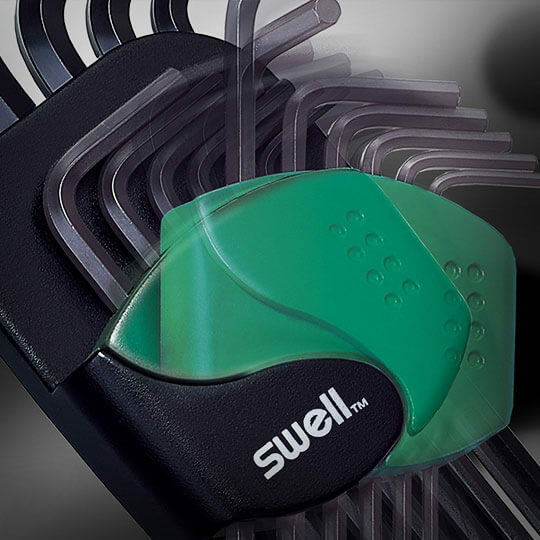 Created "SWELL" as company's brand-name. Introduced Chrome Vanadium Steel (Cr-V) material. Developed Ball-Point technic as new product range. Overall renovated inspection equipments and purchased advanced instruments. Merged with Lucky-Brand Co. Ltd., and Swell-Link Industry Co. Ltd. renamed as fomally "Jaco International Corporation". Developed Star Keys technic as new product range. Acquired iF Product Design Award 2008 for "Tai-Chi" key set . Overall Promote Mat. Chrome Finish in SNCMV material, which Offers Higher Quality. Developed Safe Insulated T-handle Hex Key product. One of Jaco's commitments is “Quality Assurance”. Our quality department constantly checks and maintains our production to ensure that each product would meet up International Standard. How does our quality department work perfessionly? QC procedures are integrated into each stage of production to guarantee standardization and stability of products. Good tools are prerequisite to the successful execution of a job. If a workman wishes to do a good job, he must sharpen his tools first. Therefore, equipment maintenance, including operation manual and periodic inspected program, is the key factory of quality inspection in accuracy. We commit ourselves to providing satisfactory products with good quality, competitve price, and perfessional service to our customers. is designed to test the torque value and the fatigue life under a tensile strain cycle, which turns around in back and forth, and to determine the fatigue life at various ratios. 10,000 Volt individually tested for applications up to 1,000 Volt Ergonomic and Shock-proof handle design. is performed during and after the heat treating process to accurately measure and constantly monitor hardness values. Jaco contends for consistent hardness and ductility.